Niagara Falls Mayor Paul Dyster is known for running one of the most secretive administrations in recent city history. Freedom of Information Law requests need to be filed in order to obtain even the most routine public documents and high priced consultants reports have been put away in drawers and forgotten about if they are at odds with the storyline Dyster himself has created. Three very high profile instances that illustrate this obsession with secrecy and a general lack of transparency have also, ironically enough, generated considerable headlines in recent years. The city’s parking meter “plan,” the probability of do-nothing Buffalo developer Mark Hamister ever actually building a hotel downtown and the chances that Niagara Falls will ever again have a real city engineer have been the subject of countless newspaper stories, and yet no one, it seems, is able to answer the questions raised. The parking plan passed last week by the city Council will cost $355,193 to buy and install roughly 40 pay stations governing about 270 parking spaces in the city’s hotel and tourism district. When Dyster first talked about parking, this tourism district proposal was referred to as “Phase 1” of a larger project that would have seen meters installed on Pine Avenue and Main Street. Nobody’s talking about that anymore, but that doesn’t mean the plan has been abandoned. The meters will cost around $100,000 a year to operate and generate around $176,000 in revenue, according to a 2011 report by the city’s parking consultant, Desman Associates. Even if that prediction holds up, it will take nearly five years to earn enough profit to pay for the initial cost of the meters. The Hamister hotel project is another news story that is now old enough to have grown whiskers. Will Mark Hamister actually build a hotel on the land he was offered for a pittance by the Dyster administration? In 2013, the rush for work to begin was so acute that formerly popular city councilman Sam Fruscione lost his seat after being portrayed in the media as an obstructionist for simply asking whether Hamister had the money to build the hotel. It turned out of course that he didn’t, and the intervening years have seen the scope of the project scaled back even as projected costs have mushroomed. What is now planned is an $18 million boxy business class hotel that will now reportedly cost $35 million – about twice the true cost in an apparent fraudulent attempt to escalate the price to get more taxpayer money. And the woeful tale of Dyster’s adventures in finding a city engineer have generated reams of newspaper copy and, most recently, an advertisement. 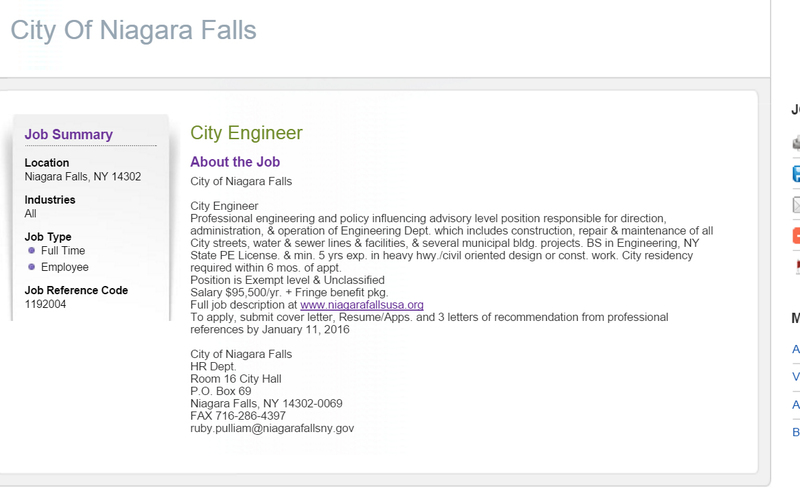 Offering a salary of $95,500 a year, the ad – which was placed several months ago – seeks candidates to fill a “Professional engineering and policy influencing advisory level position” that would require a state public engineering license and five years’ experience in heavy highway construction. City residency would be required after six months, the ad states. Dyster had one city engineer who had no license, another who was let go for not living in the city and a third who was fired after reporting work site safety violations to the federal Occupational Safety and Health Administration. For the majority of his time in office, the city has made do with high priced engineering consultants, who were often Dyster campaign contributors.